Maag has opened two new facilities in Shanghai and Guangzhou to serve the Chinese market. The first is a new 4000 m2 facility in the Jiading district of Shanghai. The new facility will include production for Maag’s pumps and pelletizers as well as offices for its sales, service and aftersales support. It will help Maag to better showcase its portfolio of pelletizer, gear pump and pulverizer products to customers, and highlight the capabilities of its Gala and RE Scheer brands. The new facility has 80 employees and features the largest rotor-regrinding centre in China, with the ability to process up to 2000 rotors per year. The second facility is a new rotor-regrinding centre in Guangzhou, which will introduce Maag’s rotor-regrinding services to its large client base in the south of China. An applications/technical lab is also being set up at the facility, which will allow hands-on demonstrations of all Maag products, including those from Maag, Gala and RE Scheer. The facility will also be home to a new sales office for the region. 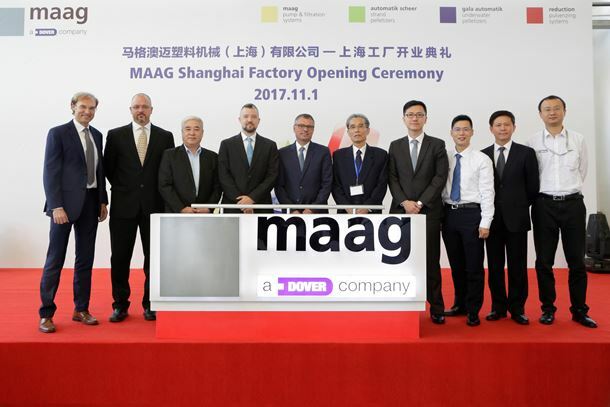 Maag, part of Dover Corp, manufactures in Switzerland, Germany, Italy, USA and China, with additional sales offices in France, Singapore, Taiwan, Malaysia, India, Thailand and Brazil. The opening ceremony at Maag Shanghai, China was attended by Ueli Thuerig, president of Maag and Paul Merich, vice president and general manager of Maag in Greater China. Maag presents a new S Series of screw pumps that offer the process industries a variety of options for conveying challenging fluids. Maag Industrial Pumps, part of PSG® has announced the release of stainless steel models of its versatile G Series Internal Gear Pumps. A new Automatik Plastics Machinery pump repair facility in Kuala Lumpur will offer local repair for Maag pumps within South East Asia. Dover Corp has completed its acquisition of the Maag Group in a US$285 million deal. Pelletizers, gear pumps and melt filters will be on display. International exhibition for the plastics and rubber industries.